Infusion Lounge - Fresh Cocktails, 60+ Premium Whiskeys, and Luxury Spirits. Say hello to Freaky Fridays with burlesque! Open the door and enter into a Baroque-style lounge reminiscent of France’s upscale underground haunts. Proceed to our marble-topped tables or mahogany leather-cushioned couches and choose an ultra-premium whiskey or a signature cocktail. Lose yourself in the crisp syncopated snare of house music as you sip your spirits. With an unmistakably unique ambiance, you’ll know you’ve made it to Infusion Lounge, an immersive experience for all the senses. You can’t buy happiness, but you can buy cocktails. With our homemade syrups, fresh juices, and local spirits, that’s close enough. Home to some of the most luxurious spirits from around the world, we can cater to even the most unambiguous palate. Our collection of bourbons, ryes, single malt scotches, blended scotches, and many more will please even the most discerning palate. 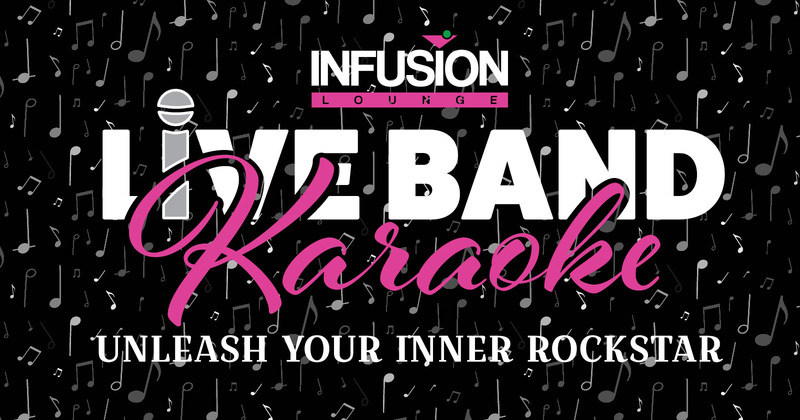 Come experience our touch screen karaoke system! See the band's song list here! Click here for Whiskey Wednesday specials here. Thank You Military & First Responders! Enjoy 50% off cocktails, spirits, wine & beer up to $ 14 when you bring your ID. *Due to online advertising policies, we cannot disclose the full details on our website. Call 267-908-4009 for more info about our Freaky Friday series! *Due to online advertising policies, we cannot disclose the full details on our website. Call 267-908-4009 for more info about our Sunday Funday special!